The American banking industry has come a long way since the Great Depression. At the dawn of the 20th century, thousands of American community banks were practically hostage to the vagaries of the agricultural economy and the caprice of the capitalist barons who by then controlled much of the continent’s transportation and energy infrastructure. Bank failures were commonplace, particularly among rural, single-branch institutions. The situation became untenable in the early 1930s when the American banking industry teetered on the verge of collapse and the country’s economy sputtered to a shaking halt. Out of this dark tableau rose one of the Great Depression’s most enduring legacies: the Federal Deposit Insurance Corporation, which insures deposits held with thousands of U.S.-chartered banks. If you have a deposit account with a bank based in the United States, you very likely benefit from FDIC deposit insurance. In the following sections, we’ll take a closer look at the history of deposit insurance in the United States, the nuts and bolts of FDIC coverage, and other types of deposit insurance available to American consumers and investors. The Federal Deposit Insurance Corporation was authorized by the Banking Act of 1933, commonly known as the Glass-Steagall Act. However, the idea of a national insurance scheme for bank deposits long predates the FDIC. We’ll pick up the story in the 1890s, during the 19th century’s last major economic panic. In February 1893, the Philadelphia and Reading Railroad failed, precipitating a financial panic that resolved into the country’s deepest economic depression to date. According to History Central, 50 railroads, 4,000 banks, and 14,000 private businesses went under in the Panic of 1893. As U.S. Treasury reserves dwindled, a syndicate led by financier John Pierpont Morgan plowed $65 million into the national bank at steep interest rates. Morgan’s bailout enraged rank-and-file depositors, many of whom lost their life savings in the fiscal carnage. Discontent rippled across the countryside, manifesting most spectacularly in kinetic labor actions like the infamous Pullman Strike in Chicago, widely regarded as the catalyst for the 20th-century labor movement. The Panic of 1893 also temporarily juiced the fortunes of the short-lived People’s Party, an anti-capitalist movement with deep support in the agrarian South, Midwest, and West. The People’s Party won more than 10% of the vote in the U.S. Congressional elections of 1894, a performance not repeated before or since. Among other radical initiatives, including the unlimited minting of silver coinage, the People’s Party’s fiscal platform called for the creation of a national deposit insurance scheme. Nebraska Rep. William Jennings Bryan, a quasi-populist who was instrumental in the 1896 merger between the People’s Party and the Democratic Party, introduced the first serious legislative proposal for a national deposit insurance fund in 1893, but it died without a vote. Following a decade of more or less uninterrupted growth, the U.S. economy began to sputter in the second half of the 1900s, culminating in a financial crisis now known as the Panic of 1907. Like the previous decade’s antecedent, the Panic of 1907 precipitated a slew of bank failures and depleted U.S. Treasury reserves. Such consequences forced a syndicate led by J.P. Morgan to prop up the ailing financial system—and, this time, New York City’s municipal coffers hit hard by Wall Street’s woes. As in the 1890s, post-panic proposals for a national deposit insurance scheme went nowhere. Amid fierce opposition from established financial firms, dozens of federal bills proposing various ideas for a durable deposit insurance corporation failed to pass into law in the quarter-century following the Panic of 1907. The best federal policymakers could muster was the passage of the Federal Reserve Act of 1913, which was a painstaking compromise that established the modern Federal Reserve System. Absent federal action, state policymakers stepped up. From 1908 to 1917, eight states established their own deposit insurance corporations: Mississippi, Oklahoma, Kansas, North Dakota, South Dakota, Nebraska, Texas, and Washington, according to the FDIC. Participation was compulsory in five states and voluntary in three. Six states provided for immediate cash compensation for insured deposits and two substituted interest-bearing certificates. All eight schemes were funded by periodic assessments on deposits held with participating institutions. In the 1920s, about 600 U.S.-based banks failed each year. Most were small, rural institutions beset by liquidity issues and subpar management. New charters replenished their ranks. The cumulative churn took its toll, though: by 1930, the state deposit insurance schemes established in the wake of the Panic of 1907 were all insolvent. The looming crisis came to a head with the financial panic of late 1929. Bank failure rates spiked in the subsequent months, exacerbated by an insular Federal Reserve that saw little reason to prop up non-members or reward what its governors regarded as pervasive and unforgivable mismanagement by provincial bank executives. Even the 1930 collapse of New York-based Bank of the United States, one of the country’s largest deposit institutions, did little to concentrate policymakers’ minds. In the first four full years of the 1930s, nearly 9,000 commercial bank charters were suspended, wiping out more than 4% of all U.S. deposits. The situation became untenable during the first quarter of 1933. In one of his first official acts, President Franklin D. Roosevelt declared a four-day national banking holiday on March 6, 1933. After passing emergency legislation to help stabilize the country’s banking system and reopen banks in the most population centers, Congress set to work on an amended version of a bank reform bill. This version included a provision for national deposit insurance. Their efforts were complicated by strong opposition from the banking industry and its allies in Roosevelt’s cabinet—and by Roosevelt’s own ambivalence. Much legislative wrangling followed. On June 16, 1933, Roosevelt signed a compromise measure, known interchangeably as the Banking Act of 1933 or the Glass-Steagall Act. The law amended the Federal Reserve Act of 1913 to allow for the establishment of a national deposit insurance corporation. The act was set to take effect on a temporary basis on January 1, 1934, with insurance for up to $2,500 per deposit account. As the depression worsened, the more robust deposit insurance provision in the Banking Act of 1935 replaced the initial proposal, guaranteeing insurance for up to $5,000 per deposit account and securing the FDIC’s place as a permanent government agency. The savings and loan crisis of the 1980s was the first significant financial shock of the FDIC era. However, it was nowhere near as severe as the panic that precipitated the Great Depression. For instance, the crisis, subsequent recession, and regional housing market depression devastated the United States’ nascent savings and loan (S&L) industry. The Federal Savings and Loan Insurance Corporation (FSLIC), whose reserves insured S&L depositors’ funds, was unable to keep pace with S&L losses as the crisis worsened. Following successive attempts at recapitalization in the late 1980s, Congress abolished the FSLIC and chartered a new deposit insurance agency, the Resolution Trust Corporation (RTC). The RTC also proved inadequate to the task. Congress merged its functions with the FDIC in 1995. Taxpayers paid a hefty price for the successive failures of the FSLIC and RTC: roughly $123.8 billion, according to the FDIC Banking Review. Though the acute phase of the crisis had long passed, the FDIC was able to mop up the lingering mess without any help from taxpayers. In March 2006, the Federal Deposit Insurance Reform Act of 2005 went into effect. 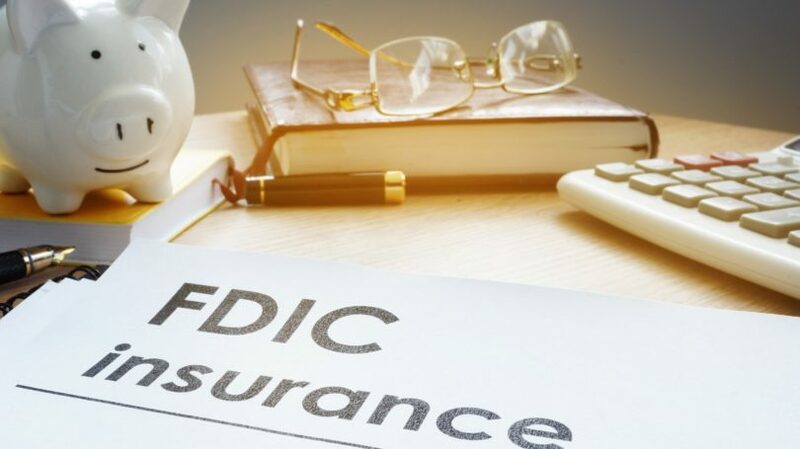 Without meaningfully changing the average depositor’s experience, the law streamlined the structure of the FDIC’s insurance mechanism, combining two previously separate funds into a single Deposit Insurance Fund (DIF). Following the liquidation of a failed bank’s assets, DIF uses its cash reserves to offset any remaining shortfall and compensate the bank’s depositors. The FDIC’s second major test, and first since the Federal Deposit Insurance Reform Act, came amid the global financial crisis of 2008 and its aftermath. The relatively small number of banks that failed in the decade following the acute phase of the crisis—just over 500, compared with more than 9,000 in the first four years of the Great Depression—belies the immense stress imposed by the 2008 crisis on the American financial system and the FDIC itself. In March 2008, before the acute phase of the crisis, DIF’s balance hit $52.8 billion, a historic high, according to the FDIC. However, as the economy worsened and bank failures piled up, DIF’s reserves dropped below the statutory minimum: 1.15% of estimated insured deposits. As DIF’s cash position worsened, the FDIC imposed an emergency assessment on all member banks, temporarily shoring up the fund. Still, DIF’s anticipated liabilities ballooned as the Great Recession dragged on. By late 2009, the fund was at risk of insolvency without further action. Rather than borrow from the U.S. Treasury, a legally permissible move that would have likely drawn out the fund’s recovery, the FDIC asked member banks to prepay quarterly assessments for the period spanning Q4 2009 through Q4 2012. This maneuver kept DIF solvent and allowed the FDIC to maintain its perfect track record of guaranteeing insured deposits. Although to be fair, it had a lot of help from other emergency government initiatives during the darkest days of the crisis. 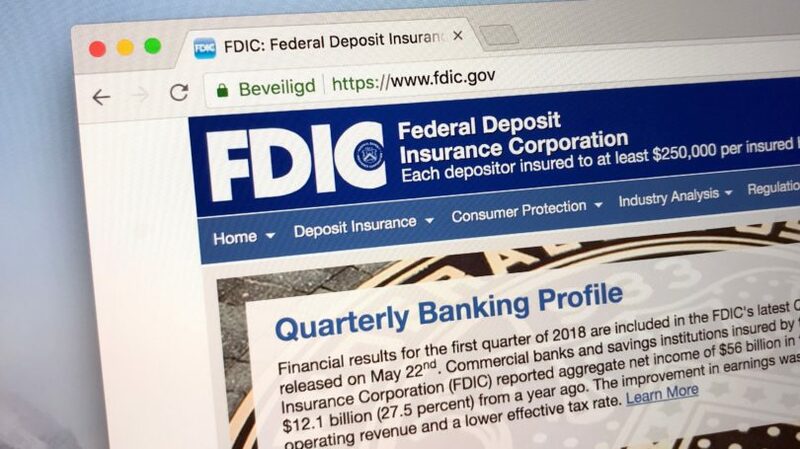 Now that we’ve given the FDIC some historical context, let’s examine what the corporation’s deposit insurance covers, how that coverage works, and steps depositors can take to maximize their coverage. FDIC insurance provides dollar-for-dollar coverage on qualifying deposits at FDIC member banks, for up to at least $250,000. When an FDIC member bank fails (defaults) or experiences terminal financial troubles, the FDIC compensates depositors for the full value of principal balances held in insured accounts, plus any interest owed through the default date. FDIC member banks are clearly identifiable by the FDIC seals displayed on branch entrances, counters, and website homepages. If you are not sure whether your bank (or any bank you’re considering opening an account with) is an FDIC member, use the FDIC’s BankFind tool to confirm. The FDIC insures all qualifying deposits held at member institutions, regardless of the account holder’s identity. Business accounts held in the name of a corporate entity are insured just like personal accounts. Account holders need not be U.S. citizens or permanent residents to qualify for FDIC insurance. Between commercial banks and savings institutions, FDIC-insured banks have some $13.58 trillion on deposit as of August 2018. However, FDIC insurance does not cover all funds on deposit with FDIC-insured banks. When a bank fails, the FDIC serves as its cleanup crew. Since the FDIC does not issue bank charters, it does not have the legal authority to close banks on its own. Rather, the FDIC serves as the receiver for banks whose charters have been revoked by chartering authorities, usually state bank regulators or the federal Office of the Comptroller of the Currency. As the receiver, the FDIC assumes temporary ownership of the failed bank’s assets. The ownership transition is invariably hasty, often occurring over the weekend. In most cases, the FDIC can find another FDIC member bank willing to assume the failed institution’s deposits and other viable assets. Ideally, depositors’ accounts are simply transferred to the new bank with no change in balance or active status. In such cases, depositors can deposit and withdraw funds without interruption. When the FDIC is unable to find a member bank willing to assume the failed bank’s deposits, the agency may instead elect to issue checks to affected depositors for their full account balances, plus any interest due, up to the insured limit. In this relatively rare instance, depositors may lose access to their funds for a few business days. Depositors with balances above the minimum insurance limit may recover some portion of excess deposits. However, the process is invariably more drawn out than that for compensating depositors below the minimum insurance limit, and the outcome is not guaranteed. Depositors generally receive compensation for excess deposits on a rolling basis as the FDIC liquidates the failed bank’s remaining assets. In most cases, payment for excess deposits is pro rata, meaning the depositor only receives a portion of the original balance. For instance, a depositor may only get 50 cents on the dollar. Depending on the complexity of the liquidation process, depositors may have to wait several years for the FDIC to fulfill their remaining claims on excess deposits held with failed banks. Individual Accounts: The FDIC treats as cumulative all balances in individual (single) accounts held by the same depositor at the same insured bank. For instance, if you carry a cumulative balance of $200,000 in individual checking, savings, and money market accounts at Bank A, your entire balance is covered by FDIC insurance. If your cumulative balance rises to $300,000 in those three accounts, you’ll have an uninsured balance of $50,000, even if no single account’s balance tops $250,000. Joint Accounts: The FDIC insures balances held in joint accounts separately from balances held in single accounts, even when the joint account holders also hold single accounts with the same institution. Joint account balances are divided equally and insured up to $250,000 per account holder. Thus, a couple can deposit up to $500,000 in their joint account without exceeding the FDIC limit. Business Accounts: The FDIC does not distinguish between sole proprietorships (single-person business entities) and their owners, even when the sole proprietorship’s name is distinct from the owner. When you have a business bank account with the same institution at which you hold personal funds, the FDIC treats your business and personal deposits cumulatively. However, multi-member business entities may be considered separately from their owners. Retirement Accounts: The FDIC considers funds held in most common retirement account types (including traditional and Roth IRAs) to be separate from funds held in non-retirement deposit accounts, even when the accounts are held in the same name. Trust Accounts: Provided certain conditions are met, the FDIC insures revocable trust account balances up to $250,000 per unique beneficiary. For instance, the balance held in a trust account with two unique beneficiaries is insured up to $500,000, the balance held in a trust account with four unique beneficiaries is insured up to $1 million, and so on. As we’ve seen, the FDIC’s national deposit insurance scheme isn’t the only form of deposit insurance available to U.S.-based depositors. These three entities also protect certain types of deposits. The NCUA Share Insurance Fund provides deposit insurance coverage for millions of American credit union members. Established in 1970 for National Credit Union Administration institutions and backed by the federal government, the Share Insurance Fund now guarantees credit union share deposits up to $250,000 per individual account and up to $250,000 across all joint accounts. For joint accounts, the Share Insurance Fund’s protection is not as robust as the FDIC’s, which may give pause to high net worth depositors weighing the relative merits of commercial banks and credit unions. The SIPC does not cover cash proceeds from commodities trades. The SIPC excludes forex, commodities, and other futures contracts from securities coverage. The SIPC does not protect against losses due to bad investment advice. The SIPC does not protect against declines in any qualifying securities’ value. Rather than provide cash compensation for liquidated securities held with troubled brokerages, the SIPC attempts to replace the securities themselves whenever possible. Not to be confused with the FDIC’s Deposit Insurance Fund, the Depositors Insurance Fund is a Massachusetts-based scheme that provides deposit insurance coverage known as DIF insurance. Launched in 1934, the Depositors Insurance Fund guarantees all deposits held with Massachusetts-chartered member banks above the FDIC’s $250,000 limit. In other words, DIF insurance allows high net worth depositors at Massachusetts banks to disregard the customary FDIC limit. This is a major incentive for depositors with sufficient resources to open free checking accounts with online banks like Bank5 Connect and Salem Five Direct—smaller, DIF-member institutions nominally based in New England’s most populous state. Reading about the tumultuous history of the early American banking industry is an eye-opening experience. Prior to the Great Depression, long-term depositors with small, rural banks faced the very real prospect of total financial ruin through no fault of their own. Today, where you keep your hard-earned money has little bearing on its security. Our nation has come a long way to secure funds for patrons and continues to improve protection efforts through legislation and customer service. While there is certainly always room for growth, we are in a much safer position than ever before. As long as you are banking with an FDIC member institution, your funds are secure. If that’s not progress, I don’t know what is. Do you have an FDIC-insured bank account?